sites. The Cozumel reef systems, located off the western coast of the island, have been preserved since July of 1996 by the Cozumel Reefs National Marine Park. With an area of over 29,000 acres the Cozumel Marine Park includes the federal maritime zone, as well as rocky and sandy beaches, mangroves and palm groves that support important biological communities. There are 26 types of corals, with over 100 subspecies, and 300 fish species, some endemic to the island like the famous Splendid Toadfish. Programs that protect Cozumel's Loggerhead, Hawksbill, and Green turtles have significantly increased their population, and as a result can be seen frequently by divers. 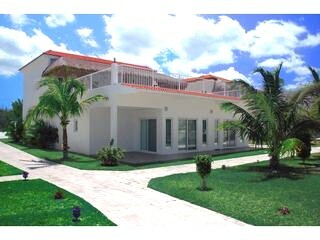 Welcome to our private luxurious 4 bedroom 4 bathroom Villa, in the gated Costa Del Sol community on the coast of Cozumel. 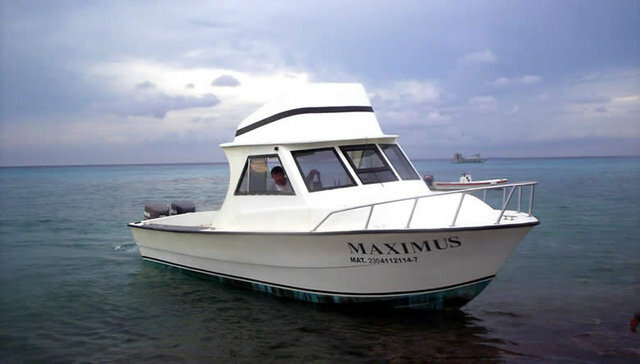 With its own dive dock and our chartered dive boat, we're minutes away from the best dive sites. Villa Coralina features king sized beds in each of two huge master suites, plus two large guests rooms with two queen beds in each - perfect for couples or singles. Just out our back door you will find 2 large swimming pools and a beautiful sandy beach. With our 2 mid-sized sedans, and only 8 guests, we'll have plenty of options for grocery runs, lunches or dinners out, or exploring the island. The kitchen is well equipped for preparing family style meals, should the group decide to eat in together. Don't book air travel without first confirming details with the trip leader. Several airlines provide direct service into Cozumel, through their US hubs. Others fly direct to Cancun, which is a bus and ferry ride away from Cozumel. Diving will be complete on Friday, though you may choose to book additional dives for Saturday, depending on departure time Sunday. Rainbow Divers is a 501(c)7 non-profit mutual benefit organization, and can only organize activities and trips for its members. Membership is cheap and comes with a bunch of new lifelong friends at no extra charge. So if you’d like to participate in this trip, please join us. Payments are due within 10 days of sign up, and are generally non-refundable. If you sign up and your plans change there may or may not be someone interested in taking your spot. If you cancel without having made all payments it is your responsibility to find someone to pay your obligation in full. It is a very good idea to carry trip insurance to cover such an eventuality. All divers on this trip should be comfortable diving in currents and have good buoyancy skills. Divers are required to carry valid, in-force dive accident insurance, such as may be obtained from Divers' Alert Network (DAN). Divers must agree to NCRD's Event Terms and Conditions to participate in this trip. Cozumel boasts world class drift diving, incredible visibility, and a diverse range of species and dive sites. The Cozumel reef systems, located off the western coast of the island, have been preserved since July of 1996 by the Cozumel Reefs National Marine Park. With an area of over 29,000 acres the Cozumel Marine Park includes the federal maritime zone, as well as rocky and sandy beaches, mangroves and palm groves that support important biological communities. There are 26 types of corals, with over 100 subspecies, and 300 fish species, some endemic to the island like the famous Splendid Toadfish. Programs that protect Cozumel's Loggerhead, Hawksbill, and Green turtles have significantly increased their population, and as a result can be seen frequently by divers.